Bob Uecker was born on Friday, January 26, 1934, in Milwaukee, Wisconsin. Uecker was 28 years old when he broke into the big leagues on April 13, 1962, with the Milwaukee Braves. His biographical data, year-by-year hitting stats, fielding stats, pitching stats (where applicable), career totals, uniform numbers, salary data and miscellaneous items-of-interest are presented by Baseball Almanac on this comprehensive Bob Uecker baseball stats page. Did you know that Bob Uecker hit fourteen career home runs of which three were off future hall of fame pitchers - Gaylord Perry on May 5, 1965 , Sandy Koufax on July 24, 1965 , and Fergie Jenkins on April 29, 1966 ? Uecker often joked on Johnny Carson's Tonight Show, where he made nearly 100 guest appearances, that he always thought the Koufax homer would keep Sandy from getting into the Hall of Fame. 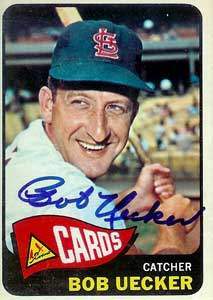 Uecker also hit one career grand slam on June 21, 1967 , off pitcher Ron Herbel . Uecker's quipped that after he hit the slam the manager of the Giants came out to the mound to take Herbel out and with him was Herbel's suitcase. Uecker was the Wisconsin Sportscaster of the Year five times (1977, 1979, 1981, 1982, 1987) and inducted him into its Hall of Fame in 2011. Uecker was inducted into the National Radio Hall of Fame in 2001. Uecker received the Ford C. Frick Award in 2003, bestowed annually by the Baseball Hall of Fame to a broadcaster for "major contributions to baseball". His entire speech can be viewed on our Bob Uecker Quotes page. Uecker's 50th year in professional baseball was in 2005 and the Milwaukee Brewers placed a number 50 in his honor in their "Ring of Honor", near the retired numbers of Robin Yount and Paul Molitor . Uecker's name was added to the Braves Wall of Honor inside Miller Park on May 12, 2009. Uecker was an inductee in the WWE Hall of Fame Class of 2010, honored for his appearances at Wrestlemania III and Wrestlemania IV. Uecker appears on a bronze statue outside of Miller Park which was erected on August 31, 2012. He was the fourth person so honored by the Milwaukee Brewers ; the others are Hank Aaron , Robin Yount and Bud Selig . After hanging up his cleats, Uecker began doing play-by-play for the Milwaukee Brewers (since 1971), a position he holds to this day. The National Sportscasters and Sportswriters Association inducted Mr. Baseball into its Hall of Fame in 2011, the National Radio Hall of Fame inducted him in 2001, and in 2003 he won the Ford Frick Award - an honor he accepted at the National Baseball Hall of Fame telling the audience, "I should have gone in as a player."